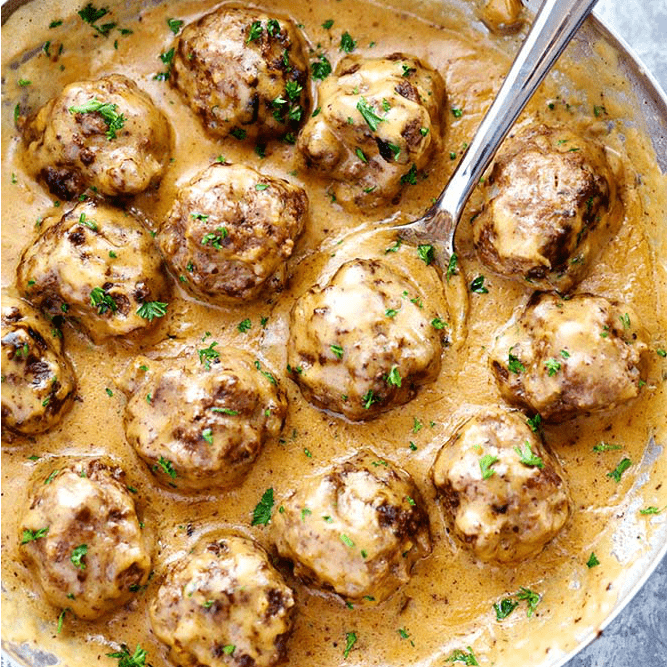 The Best Swedish Meatballs are smothered in the most amazing rich and creamy gravy. The meatballs are packed with such delicious flavor. You will quickly agree these are the BEST you have ever had! With school starting I am all about easy and delicious weeknight meals. 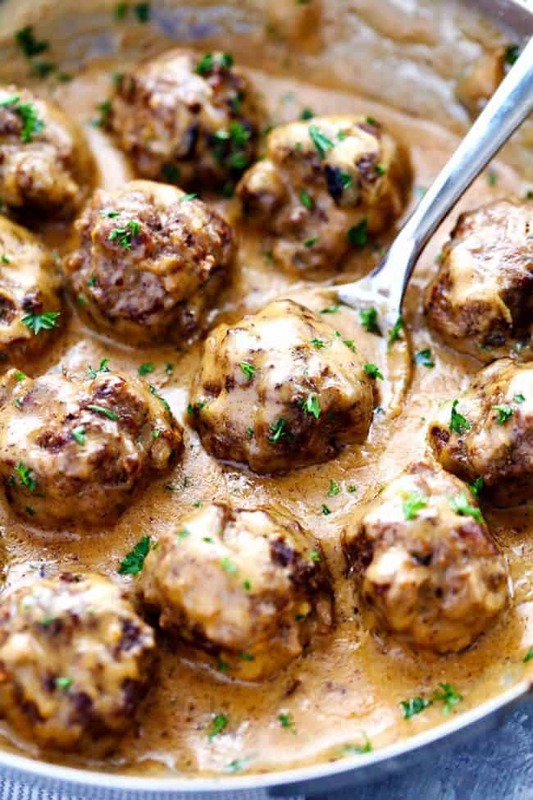 Swedish meatballs are such a classic perfect meal! And the best part… my entire family LOVES them! I used similar ingredients for the meatballs from my mom’s recipe here. But the creamy sauce has a secret ingredient that our family loves which I think adds such amazing flavor. Worcestershire sauce. It really adds good flavor to the creamy sauce and takes it to the next level. The creamy gravy sauce is really what makes this meal so incredible! This meal is ready in just 30 minutes and perfect for feeding a hungry family during the week. We loved serving ours over egg noddles, but it would also be great served over mashed potatoes or rice. It is such a classic recipe and this one I believe is the best! I know that it will become a favorite in your family as well. Don’t Forget to enter in our $550 Holiday cash Giveaway!! 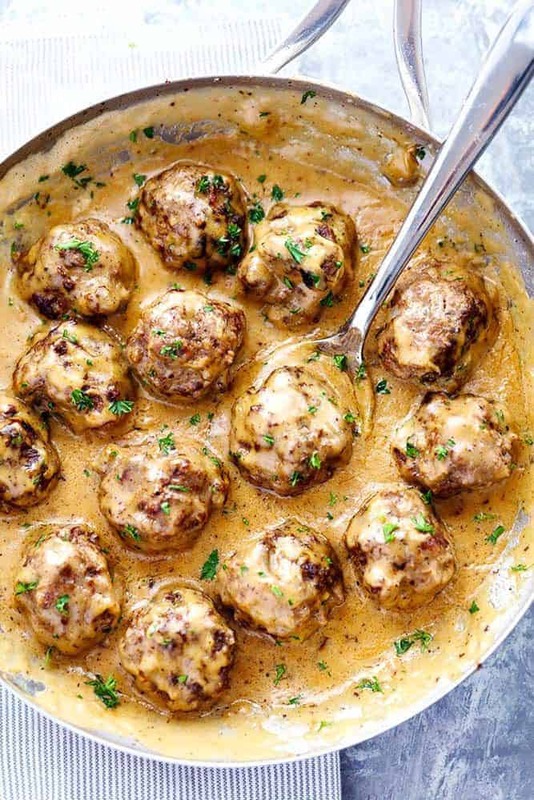 Hi I love Swedish Meatballs and giving it a go. I upped the Allspice,Garlic Powder, Parsley and Nutmeg by 1/2 and glad I did. Also using a 85/15 burger. So far without hesitation started batch 2 and 3 sooo YUM and fragrant. Sauce Is awesome! I also added all the meatballs to the sauce and cooked for 40 minutes simering with an extra 2 T of flour and 1 C sour cream (being that I am now working with a triple recipe). So glad that you loved it. Thanks for the comment and for following along with me! Thank you for this amazing idea. I tried your recipe and the food was delicious! What got my attention was the brilliant photo of your dish on the Pinterest. BIG hit in my house. I baked the meatballs while I made the sauce and plopped them in when they were done. Just made this tonight (first time making meatballs from scratch and first time making Swedish meatballs!) and we loved it! Kinda reminded me of beef stroganoff flavors. The meatballs were seasoned perfectly to me but we did add at least an extra tsp or two of Dijon to amp up the flavor of the sauce (major mustard lovers around here). Thanks for a great tasting and easy recipe! Same here… first time making meatballs from scratch and first attempt at swedish meatballs. I made ahead the meatballs and sauce tonight for our supper tomorrow night, as I am taking some night classes and won’t have time to make it once I get home from work before I have to leave for class. This way, all I have to do is come home and cook some egg noodles while warming this up and put it all together. We’re opposite about the mustard though. Around here mustard lasts forever because none of us really care much for it. My husband especially dislikes dijon mustard, but I was hoping to slip some by him to add that special oomph the sauce needs. But, he could still taste it, even though I halved the amount. Our son and daughter like regular mustard on cheeseburgers and such, but neither have tried dijon mustard. Hoping they’ll like it once we eat it tomorrow night. I liked the sauce and can’t wait to try it all tomorrow over some yummy egg noodles. I’ll have to come back tomorrow night to rate it once we’ve had a chance to try everything together. I made this tonight for my family and they loved it. I omitted the egg in the meatballs and I substituted the cream with coconut milk as I have an egg and dairy allergy. It was absolutely awesome. Thank you. 150/10! One of our favourite meals ever! That is awesome to hear!! I am so glad that you love it! The family loved it! We had them with rice and sweet peas. Thank you! That is great to hear! I am so glad that everyone loved it! Thank you for sharing and following along with me! I love this recipe. Can I freeze some for later with the sauce? Loved the recipe and the sauce is great!! Served mine the true traditional way with mashed potatoes, lingonnberry sauce and pickled cucumbers!! From this Scandinavian girl your sauce was a perfect match to what I grew up with. So delicious!! I’m an avid cook and this recipe was awesome!! The family loved it!! I’ve,add this a few times and it is so delicious I want to eat it every. Single. Day. I make the recipe exactly as described and sometimes serve it with egg noodles, or with Pioneer Woman’s stovetop mashed potatoes. Either way, I could eat the whole thing by myself. 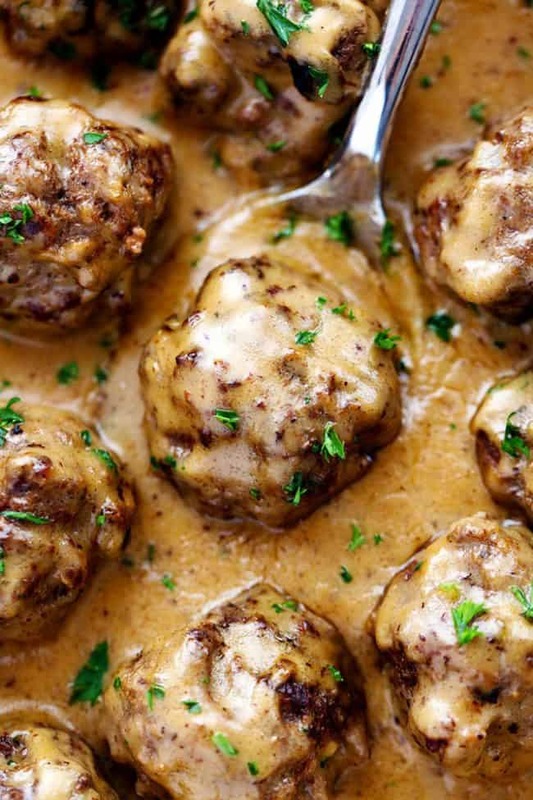 Also, this is the first Swedish meatball recipe I ever ate – and it spoiled me. I had a friend bring her version to a party recently and my bite ended up in a napkin and then the trash. And I sighed longingly for this one instead. This was my first time making this recipe and WOW love them. Oh. My. GOSH. This is my husband’s new favorite! 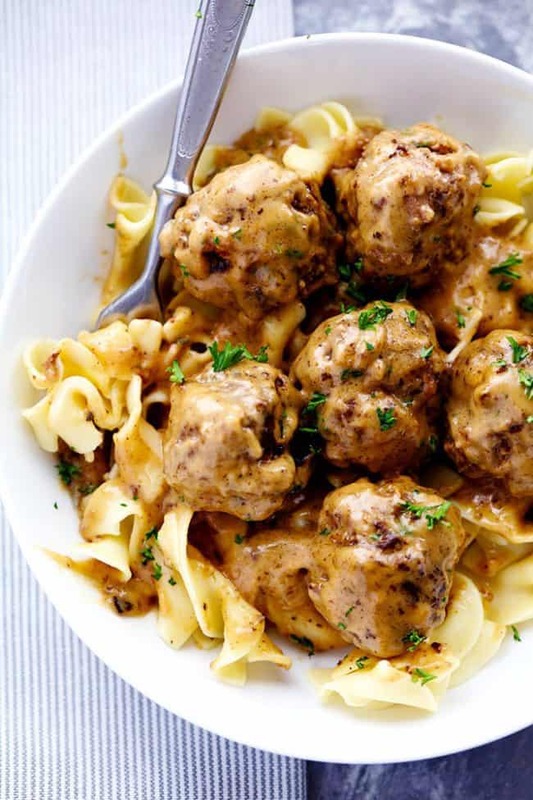 It was so good, and I’ve tried countless recipes for Swedish meatballs. Thanks for this one! We’ve made this several times, and every time it’s a hit. Total comfort food. Bringing it to a friend’s for dinner tonight because it’s a no brainer. Thanks so much for sharing this! Note: I often sub sour cream for the cream, or at least half cream half sour. I’ll omit the sour this time and I’m sure it will still be great. Yummy! I made this, but with a couple of changes. I used sour cream instead of heavy cream (I love the taste). I also added some dill to the cream sauce. Otherwise, my mother and I were licking the bowl (ok, almost). Many things are better the second day after the flavors have been allowed to meld, so I made this today for my three-year-old granddaughter’s birthday tomorrow. I did have to try one meatball with a bit of sauce and OMG! This is really really good. I had some misgivings since I don’t really care for nutmeg or allspice and wasn’t sure if the sauce would be too bland without the sour cream. It was fantastic. I made 20 meatballs, weighing 1 ounce each, and baked them at 350°F for 20 minutes. Then simmer them in the sauce for just a couple minutes. Thank you for this wonderful recipe. I just tossed out the other meatball and stroganoff recipes I have because these are my two favorites.